I have known Shaun Hunt and his company, Precision Greens, since 2010 and I have hired them several times over the years. 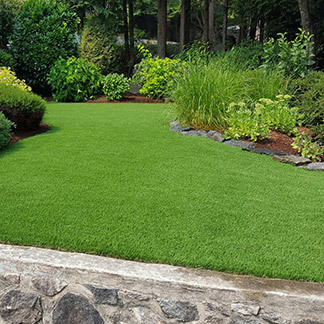 Precision Greens was initially hired to lay 6000 square feet of artificial grass as well as a full sized bocce ball court and 1000 square foot putting green at my residence in West Vancouver. Their professionalism in designing and installing was evident throughout these projects. 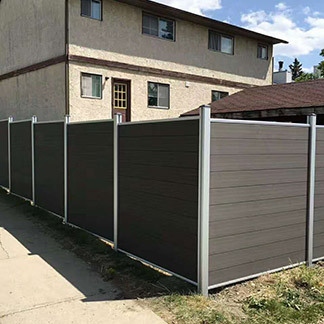 I was very impressed with their workmanship and went on to use this company for all my subsequent projects. 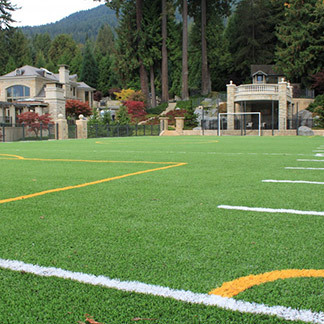 Two years later, I again hired Precision Greens to construct a multi-use soccer and football field complete with line package. The executed this project in a timely manner with great attention to detail and accuracy. Communication was maintained throughout the process. The crew was respectful and knowledgeable. 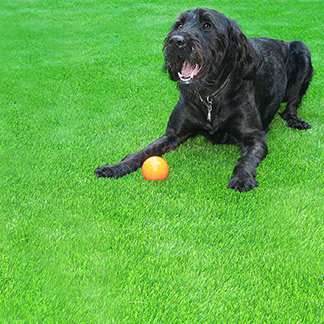 I know Precision Greens would be an exceptional choice when choosing an artificial grass installer. 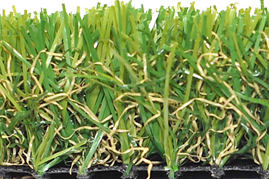 I am impressed with the durability and performance of the field. I would not hesitate to recommend Precision Greens. I wish to acknowledge and thank you and the Precision Greens team for the quality, service and workmanship displayed when you installed my synthetic putting greens and tee boxes at my Mission, B.C. property. I am very proud of my 825 yard pitch and putt course, and the quality of the putting greens, both the design which you and I worked on but as well the product installed. One year after the course was completed, it continues to play excellent. I therefore wish to thank you again for the attention to detail you and your team displayed from our first meeting through the production and installation. Your after sales service has also been very commendable. My very careful decision to choose Precision Greens for this project has been well rewarded. Your workmanship and your work ethic was impressive as was your commitment to meet my exacting criteria. Accordingly, feel free to share these comments with prospective clients. I have been well served and I believe they would be as well. This letter is to acknowledge the work done by Precision Greens for Shannon Oaks in the installation of our newest addition of the activity of \”putting\”. This was accomplished and done in a very professional timely manner. 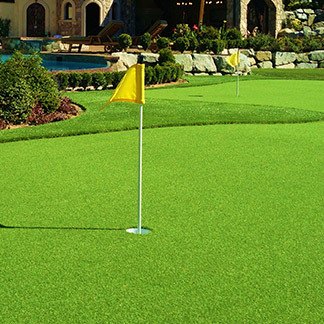 The end result is we are the recipients of one of the finest putting surfaces that can be purchased. Thanks to Precision Greens for a job well done. Our residents will enjoy this activity for years to come. We had Precision Greens build a putting green in our back garden. We are very happy with the end result. Shaun and Scott are very pleasant young men, and very professional. I would not hesitate to recommend them in the future. 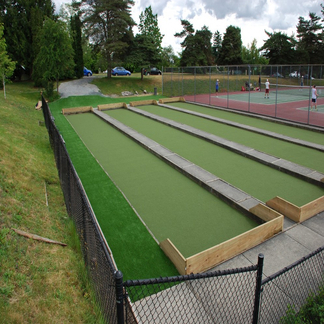 Precision Greens installed a Putting Green at my commercial facility in Abbotsford, Golf Tech. The product that they installed for me is over 1000 square feet and is in sight of traffic on Fraser Hwy. The Putting Green compliments my business greatly and I have had increased business since the greens completion. The look and layout of the putting green, sand trap and driving range is way beyond my expectations. You have created for me a golf practice area far greater than I anticipated and only a step away from my door. A terrific training centre for my short and long game and a beautiful looking facility to boot. Great work guys. Thanks for a great job. We are really impressed with the quality of the work, attention to detail, punctuality, the personable demeanour of all involved and fairness in both pricing and the little extras. You made this an enjoyable experience from start to finish. I did have a few putts last night. A little rusty but not too bad. Always sounds good when the ball hits the bottom of the cup. I have been very happy with my installation from Precision Greens. Having the best players in the country using my facility every day it is important that I provide a great putting and chipping surface for them. Precision Greens has delivered a realistic and attractive practice environment that is not breaking down under heavy daily traffic. Beyond that these guys are passionate about the quality of their work and are nice people to deal with. You did such an amazing job, thank you very much! I love what the guys at Precision Greens did with my back lawn. No more dead or brown spots to worry about. I enjoy watching the faces of my friends and family when they first see it, puzzle over it and then tentatively go out and touch it. No more mowing, fertilizing, watering or weeding. All of that has convinced us we certainly made the right decision. These boys know their stuff. Thank you for all your efforts! The yard looks fantastic and I would like to again thank Shaun for a job well done, he was professional and answered all my questions without issue. I was anticipating some additional cost for the extra work done by Shaun so no problem there. Again thanks to Shaun for making some excellent suggestions and filling the void under our patio. We are stunned at the quality of your team’s work and the time frame the job was done in. I will be giving some of your company cards out at work as a number of my colleagues have seen the sample and have expressed some interest. Thanks to your team for their hard work. Wow, what a difference you made to our backyard! Previously, it was a muddy pond that we tried valiantly to correct. My wife spent hours cleaning dog prints off the floor during the rainy seasons. 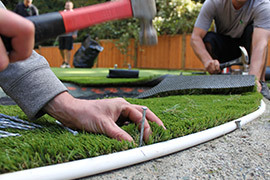 Artificial grass was our final attempt before considering concrete, which wouldn’t make Sully the dog very happy. The difference is night and day, gone is the water; gone is the mud. Instead it’s been replaced with a little golf course! We were particularly impressed by the quality of the workmanship and the speed in which it was completed. We also checked out the competitors and Precision Green was the best value for the money. Thank you, Travis! Our only regret is that we didn’t call you sooner. The response by the residents to both the boulevard and the Putting green have all been positive. The overall look adds a touch of class to our development/properties as well as providing a really nice amenity which appears to already being quite popular. I’ll stay in touch and thanks again. Our front yard has recently undergone a huge transformation from an unfinished construction phase to a manicured lawn. 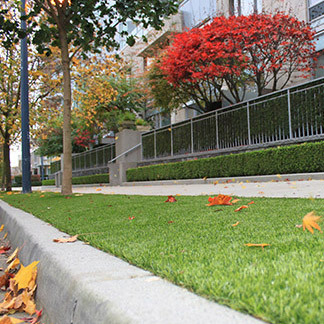 The work was completed by Precision Greens. My first contact was with Paul, who from the start, demonstrated honesty and integrity in our on-site meetings. Emails were promptly answered. We were given several completed job sites to view so that we were able to make the best choice for our property. There was never any pressure, just direct answers to all our questions. Paul even communicated with our contractor giving him direction as how to prepare the ground for the installation. We decided to move forward even though the work would be done in December. The crew worked tirelessly in pouring rain under tarps, as the grass had to be kept dry to do a proper install. The men were all professional, polite and worked diligently each day from early in the morning until dark. There was interaction with the foreman; we exchanged ideas and in the end, right choices were made thanks to his expertise. At the end of each day the work area was left clean. The very last day work was completed at 6:30 P.M., again under a tarp with night lights. We are immensely enjoying our garden as are many passersby and neighbours! We highly recommend Precision Greens without hesitation for their high quality product, and their prompt and efficient installation of it. We have hired many construction trades in the past, and this group stands out as exceptional. I want to thank you guys from the bottom of my heart for the beautiful yard I now have. Adam and Josh were such a delight to work with and I will without hesitation request them again should we decide to do the front lawn. Thank you for an excellent team, a brilliant installation and an excellent product. We are very happy.